When I was eight years old my mother took me into town. At the Amstel Station, fifteen minutes from where we lived, we visited a book store, where I had my first encounter with comic magazines. I knew what comics were, my parents had subscribed me to ”Donald Duck” and I had read several other comic books, but I had never seen a comic magazine and I had no idea that there existed something as super heroes! Seeing a rack full of Dutch comic magazines was too much, I was completely hypnotised. 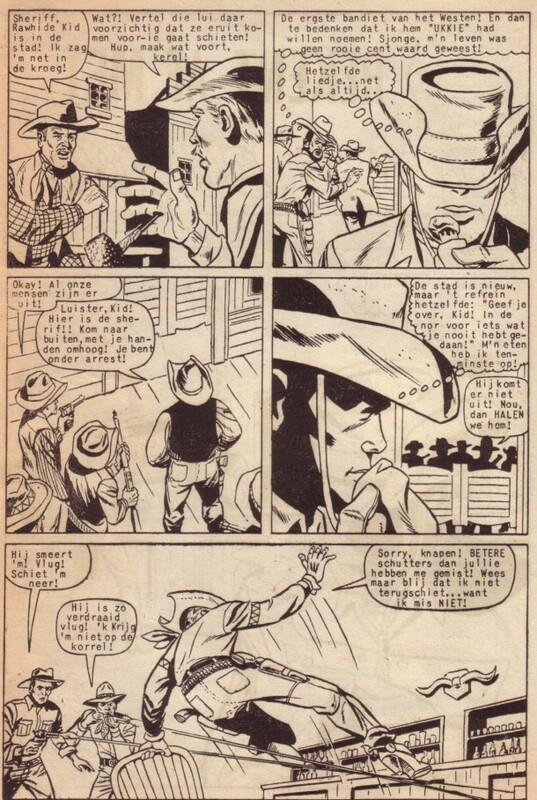 My mother told me that I could buy one, and after long thinking, I choose a cowboy comic, called “Rawhide Kid” . A few years later I had a large collection of Dutch comics, that I all knew by heart. I have no idea what I did with all these comics, but most them were already gone when I left my parents’ home. Last week I found a copy this ”Rawhide Kid” comic in a second hand store. The cover was exactly as I remembered, but the story itself looked very different on first sight. It was clearly not the perfect art that my mind had made of it in all those years. But when I began reading, interesting things happened: all kind of memories came back, and my memory of the comic merged with what I held in my hands. Hey, there is no soundtrack for today! 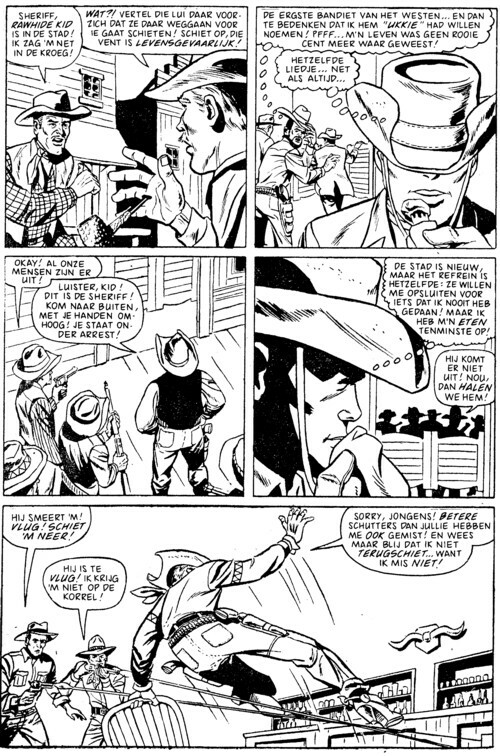 toch moet me van het hart dat het zien van de knullige lettering van de Rawhide Kid wel een hoop sentiment losmaakte bij mij ook al had ik als kind al mijn bedenkingen erbij. ik krijg ook nog steeds een wee gevoel van met cursieve Nobel gevulde Carl Barks ballonnetjes. 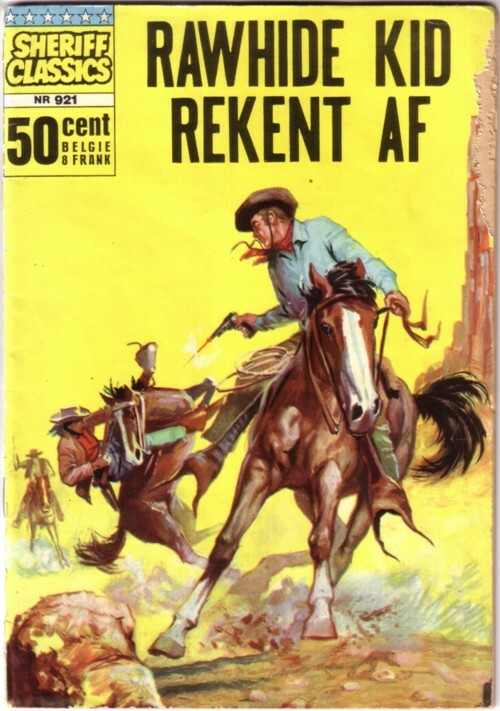 Is het geen idee om Rawhide Kid (ook een van mijn old time favourites) opnieuw uit te brengen met jouw lettering!? Ik zou zo maar een pagina van RK in jouw lettering aan de muur kunnen hangen!